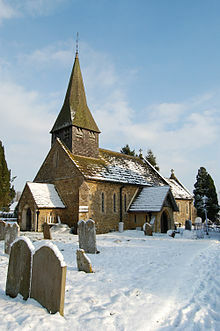 Capel (/ˈkeɪpəl/) is a village and civil parish in southern Surrey, England. It is equidistant between Dorking and Horsham - about 5 miles (8.0 km) away. Around Capel, to the west, skirts the A24 road. Capel is approximately 2.5 miles (4.0 km) north of the West Sussex border, 26 miles (42 km) south of London and 12 miles (19 km) southeast of Guildford and is in the Mole Valley district. The village is in the north of a landscape called the Weald, meaning forest, which forms a significant minority of the land today, particularly towards the Greensand Ridge. Within the parish in Coldharbour there is one Scheduled Ancient Monument, a large Iron Age hill fort named Anstiebury Camp evidencing early occupation. Multivallate, defined by boundaries consisting of two or more lines of closely set earthworks, this relatively late hill fort constructed in the second and first centuries BC covers approximately 5 hectares (12 acres). There is a triple rampart wall to the north and south-east where the ground is fairly level, a double terrace on the west and south where the ground is much steeper, and a single line of defences to the north-east. The entrance is mid-way along the eastern side, defined by a wide break in the main rampart. Trenches dug in the southeast, the entrance, and a few other investigations in 1972-3 revealed that the front of the main rampart had been set against and into the edge of the associated ditch and revetted with massive, irregular blocks of sandstone. The conclusion was that the purpose was to resist sling warfare due to the form and width, with rounded pebbles, foreign to the Greensand Ridge, being frequently found in the areas excavated. The archaeologist also considered that the entrance and the defences to the north of it were never completed, possibly linked with the deliberate demolition of the main rampart revetment, and possibly coinciding with Caesar's invasions of Britain. The site was re-occupied in the Roman period, probably at least a century after it was originally abandoned. The original settlement of Capel consisted of approximately thirty farms, most of which still exist today bearing the names of their tenants in the early 14th century. Timbers in some of the farmhouses have also been dated to 14th century. The lands are principally arable, producing good crops of wheat and oats, and the soil is also well adapted to the growth of timber. Broom Hall [sic] here is an elegant edifice, on the south-eastern confines of Leith Hill. The living is a donative [not a rectory], in the patronage of Charles Webb, with a net income of £84: the tithes have been commuted for £610. The 13th century church, pictured, was enlarged in 1836, paid by Revd. John Broadwood and was restored in 1858 by architect Henry Woodyer, who installed a spiral staircage and bell cage in the same style as Buckland's church. In the 17th and 18th centuries Capel was the centre of a thriving Quaker community which met at the houses of the local Bax family. The Quaker Sussex Quarterly Meeting recorded the fact that Thomas Patching "who then lived at Bonwick's Place in Ifield" met with George Fox, and then later "there was settled the first Monthly Meeting that was set up in this county .... and has since been removed to the house of Richard Bax at Capel in Surrey by reason of Thomas Patching's removing from that place". 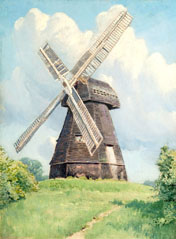 It is known that George Fox visited Surrey in 1668 and held a Meeting at Plaistow Farm, Capel, the home of Richard Bax. The Friends Meeting House is in the main conservation area of the village; it is also a listed building. The historic Crown Inn is the village's sole surviving public house. The area is in the Green Belt surrounding London and has two conservation areas, one in Coldharbour and one in Capel itself. Beare Green has a train station with direct services to London Victoria, Holmwood Station, in the main, new part of the village West of the A24, and a primary school in old Beare Green to the East of the A24, but has no pubs : the former Duke's head pub at old Beare Green is now an Indian restaurant, The British Raj. The Anglican parish church of St John The Baptist is a grade II listed building, as are eight nearby buildings in the Capel Conservation Area, A Friends Meeting House serves Quakers, who have been in Capel since the 17th century. There is a lively, fairly informal monthly church service in Beare Green Village Hall on the first Sunday of each month, at 11:15, known as Café Church, suitable for (and attended by) all ages. Average attendance is about 30, peak so far being 60. 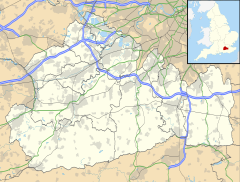 Beare Green (/ˈbɛər/) is a separate locality also within the same A24 bypass with a population of 1,323, made up of 607 households. It is located about 1 mile (1.6 km) north of Capel; Beare Green's roundabout, to its north, is at one end of the A29 road to Bognor Regis on the English Channel. Holmwood railway station is within Beare Green, and is considerably south of South, Mid and North Holmwood, so that it appears to be mis-named. It is a station towards London on the Mole Valley Line. Older maps label Beare Green as being where the Duke's Head pub and Weald School are, on the East side of the A24 dual carriageway. This is the original location of Beare Green. This area now has 100 older houses, the Surrey Hills Hotel and 120 mobile homes [in 2 parks on Horsham Road], that lie to the South and East. The larger part of Beare Green, that is signed as Beare Green from the A24 dual carriageway, sits to the West of the A24 and now has 400 homes and all the shops plus the railway station (mis-named Holmwood Station), the village hall and the new playing area. Field Hockey player, and Olympic Gold Medalist, Stephen Batchelor was born in Beare Green on 22 June 1961. 1996 Grand National winner, Rough Quest was trained for the race by Terry Casey at Henfold House Stables, in a farm close to Beare Green in Capel. Coldharbour is the locality within the civil parish 3 miles (4.8 km) to the northwest. It is situated on the southern and eastern slopes of Leith Hill in the Surrey Hills Area of Outstanding Natural Beauty; Leith Hill is the second highest point in southeast England and lies on the Greensand Ridge that runs from near Hindhead to the south of Maidstone, Kent. Coldharbour has a conservation area along its highest roads with two listed buildings. Christ Church is a chapel built in 1848. Members of the Wedgwood and Vaughan Williams families lived at Leith Hill Place. Broome Hall near Coldharbour is a Grade II listed stone mansion, dating from 1750. From 1946 to 1969, it was a novitiate house for the White Fathers. In the 1970s and 1980s it was the home of the actor Oliver Reed. Europa Oil & Gas Ltd submitted in 2008 a planning application to Surrey County Council to explore for oil and gas[n 1] [n 2] in Coldharbour but this was rejected by the Planning Inspectorate based upon a public inquiry in October 2012. The proportion of households in the civil parish who owned their home outright compares to the regional average of 35.1%. The proportion who owned their home with a loan compares to the regional average of 32.5%. The remaining % is made up of rented dwellings (plus a negligible % of households living rent-free). Aside from the A24 road the village is served by Ockley railway station - considerably closer to Capel than Ockley itself as it was sponsored by a peer of Ockley, on the Mole Valley Line between Dorking and Horsham with direct services to London Victoria station and a change of train in Epsom possible for the service to London Waterloo. A bus service runs along this main route to Dorking and Horsham. ^ The Parish Council were informed of the date of announcement of the Inquiry's result into proposed Oil and Gas works - Monday 15 October. ^ At the same census, the census ward Capel, Leigh and Newdigate had a population of 3,882. ^ a b Anstiebury Camp: a large hillfort south-east of Crockers Farm Historic England. "Details from listed building database (1007891)". National Heritage List for England. Retrieved 26 October 2012. ^ Broome Hall, Grade II listing Historic England. "Details from listed building database (1028759)". National Heritage List for England. Retrieved 26 October 2012. ^ St John's Baptist Church: Historic England. "Details from listed building database (1378150)". National Heritage List for England. Retrieved 12 July 2015. ^ Grade II listing of Friends Cottage and Friends Meeting House: Historic England. "Details from listed building database (1028737)". National Heritage List for England. Retrieved 26 October 2012. ^ The Crown Inn, Grade II listing Historic England. "Details from listed building database (1378150)". National Heritage List for England. Retrieved 26 October 2012. ^ "direct.gov.uk search". Archived from the original on 3 March 2016. Retrieved 27 March 2010. ^ G.M. Miller, BBC Pronouncing Dictionary of British Names (Oxford UP, 1971), p. 12. ^  Retrieved on 26 August 2017, see section 6.18. ^ Henfold House Stables website. Retrieved on 30 May 2011. Surrey County Council. "Capel". Exploring Surrey's Past. Retrieved 31 May 2017. Surrey County Council. "Coldharbour". Exploring Surrey's Past. Retrieved 28 December 2017.